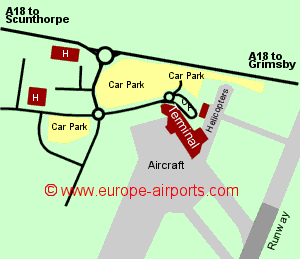 Humberside airport has a main terminal and attached heliport terminal mostly servicing North Sea oil rigs. A coach service operates between the airport, Hull and Grimsby, running approximately at hourly intervals during the day, priced at 3.20 and 4.50 Pounds respectively. Barnetby Railway station is 5 Km from the airport and has InterCity connections. 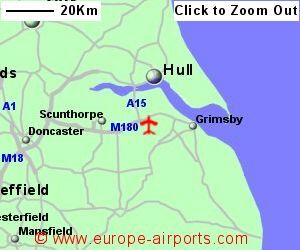 Humberside airport has 3 bars/restaurants, 2 shops, bank/currency exchange facility, an executive lounge, and conference facilities for upto 35 people. Free (for 30 minutes) Wireless Internet access is available, along with a paid for superior service. The Nightel hotel is located within walking distance of the terminal and is aimed at business travellers and oil rig personnel only. Passenger numbers for 2017 were 190,000, a 5% decrease from the previous year, and well below the high of 531,000 in 2004.